Cassandra was a daughter of Priam, the King of Troy. Struck by her beauty, Apollo provided her with the gift of prophecy, but when Cassandra refused Apollo's romantic advances, he placed a curse ensuring that nobody would believe her warnings. Thirty years ago, when the then-young cartoonist Matt joined the Daily Telegraph, one of his first jobs was to produce little cartoons to illustrate the paper's satirical Way of the World column, which Booker was then contributing. Once, he asked him to draw Cassandra standing amid the smoking ruins of Troy, holding a placard reading, "Remember folks, you read it here first". But, writes Booker in today's column, since Cassandra's curse was that no one should believe her, over the past two years, ever since Theresa May announced her decision to leave the EU's integrated internal market, one or two of us have sympathised with Cassandra. We immediately began explaining the more obvious problems this fateful decision would face us with, since it would severely damage much of that export trade to the EU which earns one pound in every eight of our national income. Our manufacturing of cars, medicines and chemicals would all be seriously at risk, as would our Dover/Channel Tunnel link with the continent, much of our agricultural export trade and even the participation of Irish horses in Cheltenham and the Grand National. While on no rock was May's plan eventually more likely to founder than the inevitability of a "hard Irish border". But much more significant than the failure of anyone to heed our own predictions was Britain's inability to listen to what we were being repeatedly told by the EU itself. Recalling that joke Thirties headline "Fog In Channel: Continent Cut Off", our politicians seemed incapable of understanding the EU's endless explanations of the legal position in which our choosing to become a "third country" outside its market would leave us. No matter that the EU set all this out in sober technical detail in its 84 "Notices to Stakeholders". The seeming failure of our politicians even to read these made it ever more likely that we would end up with the ultimate catastrophe, whereby we crashed out of the EU without a deal. In that sense, Booker concludes, the real Cassandras in this story have been those technocrats in Brussels. They tried to warn us of the realities we were facing. But that fog in the Channel rendered us incapable of listening. And in writing this commentary, Booker really has put his finger on an interesting (and important) phenomenon. There, free for anyone to read on the Commission's website are the technical evaluations of the consequences of the UK leaving without a deal, referenced back to the legislation and other sources which guide readers to the original source material. Apart from a few technical journals, though, the coverage of these Notices has been sparse. They have rarely featured in Westminster debates, politicians rarely (if ever) mention them in interviews and, as far as the legacy media goes, they might just as well not exist. We are in the midst of a persistent global information war. We live our lives on technologies that sow distrust and fakery, that admit little room for nuance and complication, that slice us up into ignorant and bleating tribes. It is an era that should be ripe for journalists and for the business of journalism - a profession that, though it errs often, is the best way we know of inoculating ourselves against the suffocating deluge of rumour and mendacity. Accessible to UK readers, BuzzFeed contributes to the media narrative on Brexit but even a deep search of its website will fail to detect any reference to the Commission's Notices, despite self-important pieces from the likes of its news reporter, Matthew Champion, telling us "what you need to know" about Brexit. However, the man finds space to relay the information that: "The man who plays the bagpipes outside Parliament is playing the Game of Thrones theme song". That, essentially, is the media's curse – without even the intervention from the Greek gods. The "business of journalism" – so vital to the functioning of a democracy – has degenerated into the business of retailing endless trivia, for want of real news and analysis. If more journalism means more trivia, and fewer journalists mean less, the BuzzFeed redundancies are a blessing. As for the politicians, I tend to see them as the other half of the same coin, what I call the "politico-media nexus". It is interesting, therefore, to find journalists writing critical pieces about the failures of the political process when, to a very great extent, their trade shares responsibility for those failures. One of the more recent offerings in the genre comes from Steve Richards writing in the Financial Times, under the headline: "Parliament is ill-equipped to deal with Brexit". His thesis is summed up in the sub-heading which asserts: "Too many MPs are cowed by their constituents and in thrall to local parties". Both those things may be true, but they are only part of the story. Arguing that, "at this moment of epic significance", the Commons "fails spectacularly to rise to the occasion", Richards tells of watching MPs debate Brexit. "Each time", he says, "I hope to listen to a game-changing speech or to observe the emergence of big figures around whom MPs can coalesce. Each time the debates go around in tedious circles as if repetition is a way of avoiding the historic challenges". The reason for this, he adduces, is that the UK has the weakest House of Commons of modern times. With some admirable exceptions, he says, there are few big figures framing arguments and candidly telling their constituents that Brexit has hardly begun. As a result, they are prey to the whims of their constituents and too fearful or weak to make the case in the face of their demands. Personally, I don't buy this argument. It seems muddled and inconsistent, especially where many MPs seem at odds with their own constituents – and even with their own parties. But what Richards is sensing is not inconsistent with the view that we are in the thrall of a parliament where members simply have no grip of the issues, and are taking their leads from the media. Some time ago I recall reading an article which reported that, despite the wealth of technical material available to them, the way most GPs acquainted themselves with developments in their own profession was from reading about them in the popular media. So it is, I believe, with MPs who are almost totally reliant on the legacy media for their political information. Obviously, with the diversity of viewpoints expressed, they can pick and choose their sources but, once selected, these provide them with what they need, each grouping believing that the media is conveying the view of the wider public. Where there are gaps, some MPs seem to make it up as they go along. Curiously, though, there is feedback, where the politicians talk to the media, who then report what they say, which is then absorbed by their respective peer groups, reinforcing views already held. Thus the politico-media nexus becomes a closed loop, where the public are actually passive spectators – if indeed they are even engaged, which increasingly they are not. Here, the core of the problem is that neither the journalists nor the politicians have any serious knowledge about the way the EU works. When they are also obsessively London-centric, immersed in what I call the "court gossip", there are times when one feels that, from their perspective, Brussels doesn't even exist. It is in a parallel universe. For this Sunday, therefore, we are entertained by plans to evacuate the royal family from London in the event of riots triggered by a no-deal Brexit, something which has the Mail on Sunday squeaking with indignation at the Queen being "dragged into an extraordinary 'Project Fear' row". On top of the almost obligatory speculation about a general election, we see this village parochialism go all the way to the top with an authored piece by Theresa May in The Sunday Telegraph, in which she glibly asserts: "I will battle for Britain in Brussels". "When the House of Commons refused to support the withdrawal agreement", the prime minister tells us, "I listened – I pledged to think again, and go back to Brussels to secure a plan that Parliament can stand behind". Despite having been told at every level from Brussels that there will be no renegotiation, she calls on MPs to put their efforts "behind securing a better Brexit for all of us". All she will acknowledge is that, "negotiating the changes MPs want to see will not be easy", but she then claims that, "if we stand together and speak with one voice, I believe we can find the right way forward". This is not someone who, at first sight, is even on the same planet as the rest of us. She seems trapped in the Westminster bubble, sustained by the belief that Brexit can be delivered by MPs alone, standing up for what they alone agree should be the content of the withdrawal agreement. But whatever view any MPs might hold – from a distressingly limited range – they can always find something in the legacy media which will support their stance, allowing a trade in ignorance which provides mutual support in the battle against the real world. Thus, in the "Battle for Brexit", we have the politicians and media huddled together in their clumps of self-belief, entirely resistant to external pressures and thought. 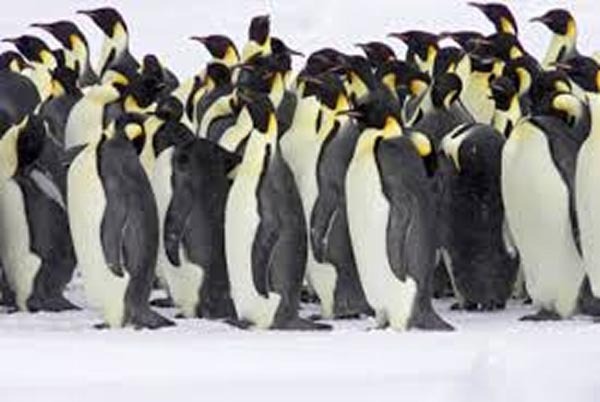 They are reminiscent more and more of the extraordinary groups of Emperor Penguins who huddle together for support against the Antarctic winter, as they incubate their young. But it is ideas, not offspring, that emerge, totally sterile and bereft of any vitality. Created without reference to the real world, they can only leave us standing in awe as we struggle to cope with the idea that the process we are witnessing can exist at all. Meanwhile, Cassandra goes on unheard.